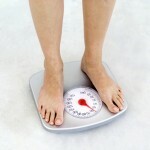 1) Calculate your basal metabolic rate (BMR) by multiplying your body weight x 10. For me, that’s currently 120 x 10 = 1200. 2) Add your Physical Activity Calories by multiplying your BMR x your Activity Level (Sedentary = x .20; Lightly Active = x .375; Moderately Active = x .40; Very Active = x .50). For me, that’s 1200 x .375 = 450. 3) Add your Digestion Calories by multiplying your (BMR + Physical Activity) x 10% (or .1). For me that 1650 x .1 = 165. 4) Add ’em up! Your Total Daily Caloric Expenditure = BMR Calories + Physical Activity Calories + Digestion Calories. For me, that’s 1200 + 450 + 165 = 1,815. In other words, on a normal day my body burns 1,815 calories. Note: One pound of fat = 3500 calories. To lose one pound of weight per week, then, I would have to eat 500 calories less per day than I do when maintaining my weight -or- I would have to burn 500 more calories through exercise -or- a combination of the two.